In front of the Massive Dynamics building in New York, the light post was a large sticker that reads www.GlowingMonkeys.com. The site was registered in June of this year, so it's entirely possible that it is "in-game". There are currently 237 posts, many of which seem to revolve around Fringe science - Large Hadron Collider, Cloning, Dark Matter, etc. That's a lot of posts just to make for a TV show. Could this website actually be a reference for the show's writers, a part of the Viral world, or could it all be a huge coincidence? Well seeing how the actual building is in Toronto and the lamp post seems to be comped in after the fact, I'm gonna say it's link was intentional. The show was presented in May for television upfronts, so the June date isn't all that weird. Whether Bad Robot is behind the site, I dunno. Did anyone else notice that there are 0 comments on the posts? Yeah no comments from anybody. It is a very strange site...of course I suspect it is show related...cows in one of the posts. it's not Toronto. It's clearly the number 7 WTC building in NYC. Did anyone notice on the window of that shot that there are words? It says something like " . . . . must be bought"? I noticed a creepy man in the hat and suit walking buy, paused my DVR, and then saw the writing on the window. Then I saw that man again in the previews after the show. obviously, showing the sticker was intentional. but did anyone think it could ALSO be a hint to Michael Crichton's book "NEXT"? We LOST fans know how many times literature have been mentioned in J.J. projects. You can see a "NO PARKING SATURDAY" poster on the lamp post. Those appear in Toronto when there's filming going on. 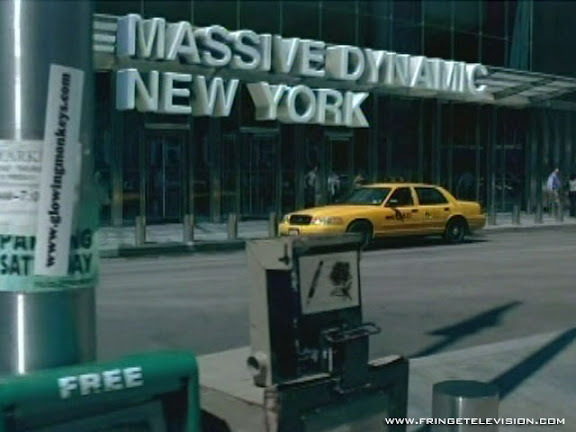 A promo shot from a leaked pilot shows that originally they used the Royal Ontario Museum for the exterior of Massive Dynamic (they kept some interior shots when the action moves inside). Apparently they replaced the exterior with 2nd unit footage from WTC later on. I just tried checking the page and I got a godaddy website registration page.So does this mean it wasn't related or did they just forget to pay for use of the name? I'm not sure about all the shooting, but there is a whole lot of TO (aka Toronto) in the footage. There's a lot of University of Toronto in there: University College and front campus were in the opening episode. There's the Gardiner Expressway in there and in the episode I saw today, the Bayview Extension. I don't live there any more, but I recognize not only city sites, but the look of the neighbourhoods, houses etc. I thought I saw the CN tower in the background at one point, but it was so fleeting that I'd need to pause it to verify.